Management offices and meeting rooms are formed with simple projecting ?portals? extending into the central circulation space, respecting the exposed concrete structural frame of the existing building which is highlighted with feature lighting. 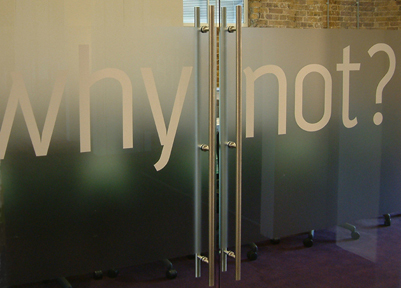 Maximising the use of full height glazed screen walls allows natural light to penetrate deep into the heart of the building, while the etched graphics provide a suitable level of privacy for the occupants.